Groundsel is in the Asteraceae family (also known as the sunflower, dandelion, or thistle family). It is a winter annual, as the seeds germinate in late fall through early spring. The plant matures throughout spring and early summer and usually dies in the summer heat. The first true leaves of seedlings have shallow teeth and may be purple on the underside. Later developing leaves are more deeply lobed, with the plant growing 12-24 inches high. Flowers are bright yellow, and when the seeds mature, the bracts fully open to reveal a ball of white-tufted seeds. Alfalfa field contaminated with common groundsel. Photo by M. Canevari. 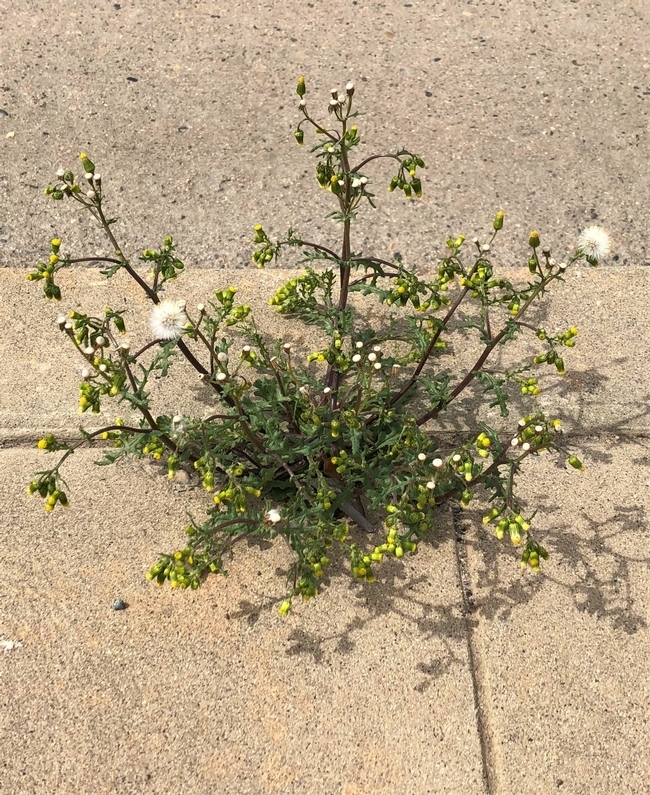 Sometimes groundsel can be confused with three other winter annual weeds in the same family, including hairy fleabane (Erigeron bonariensis), sowthistle (Sonchus oleraceus), and prickly lettuce (Lactuca serriola). All four species share a common trait with yellow flowers and fluffy white seed heads that are wind dispersed. Hairy fleabane, sowthistle, and prickly lettuce are not toxic to livestock, and contaminated hay can still be fed to livestock without the concern of poisoning. However, none of these three species are compatible with producing high quality hay and may reduce forage palatability and testing values. For more information on differentiating these species, check out our blog post which specifically addresses Asteraceae identification. Options for Control - Timing is Key! There are several options for controlling groundsel in alfalfa fields, although timing is critical to ensure success. Once groundsel plants are large and flowering, there isn't anything that can be sprayed to effectively control these weeds in alfalfa fields. While, burning the plant back with an herbicide would reduce the amount of weed biomass and seed set, the toxicity will not be eliminated. The time to target groundsel, or any other member of the Asteraceae family, is shortly after weeds have germinated, when plants are still small, less than 2-inches in height or before rosettes reach 3-4 inches in diameter at the time of application. Note: there are many restrictions regarding the use of various herbicides in alfalfa. Always read and follow the entire label before use. Groundsel seedling. Photo by J. K. Clark. From: Weeds of California and Other Western States by J. M. Ditomaso and E. A. Healy. In seedling alfalfa, Butyrac (2,4-DB)+ and Buctril (bromoxynil) control groundsel, sowthistle and prickly lettuce. Applications should be made when the crop is in the second trifoliate leaf stage and before weeds have reached 2-inches in diameter or height. Both Butyrac and Buctril work well when plants are actively growing in warmer conditions not exceeding 80 degrees. Always check the forecast before applying Butyrac; if significant precipitation/irrigation occurs within four days of application, severe crop injury can occur. Limited options are available for hairy fleabane control in conventional seedling alfalfa. Control of all four species can be achieved using Roundup (glyphosate) in a Roundup Ready (RR) production system. Roundup can effectively control larger weeds up to 6-inches in diameter and may be applied to seedling alfalfa at any growth stage without risk of crop injury. However, there are two caveats with Roundup. First, up to 10% of the alfalfa seeds in the seed bag may not have the RR trait. An application of Roundup should be applied before the fourth trifoliate growth stage to kill off the non-transgenic crop plants before they establish. Second, in the Central Valley, there are confirmed populations of hairy fleabane resistant to Roundup which could limit the use of glyphosate in RR alfalfa*. In established alfalfa, winter annual Asteraceae species (groundsel, sowthistle, prickly lettuce, and hairy fleabane) will germinate in multiple flushes throughout the cool season. Therefore, the timing of herbicide application is critical. Most of the products with foliar activity are only active on weed seedlings less than a few inches in diameter or height. Crop safety is achieved with many of these products when applications are made to dormant alfalfa. Making applications too late can result in poor weed control and crop injury associated with the herbicide application. The standard burn-down treatment for many years, Gramoxone (paraquat)+ will control susceptible biotypes of hairy fleabane (some populations are resistant), but only gives suppression of groundsel and prickly lettuce. Sharpen (saflufenacil) applied with an oil adjuvant can offer good burn down control of all four Asteraceae species when applied to rosettes smaller than 4 inches. 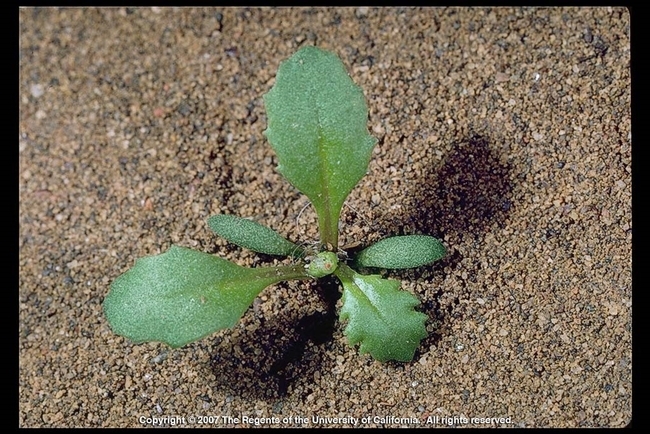 Shark (carfentrazone) applied with an oil adjuvant to small rosettes can provide partial control of common groundsel and good control of the other three species. Like in seedling alfalfa, Roundup can be utilized in a RR alfalfa system to control all four species*. 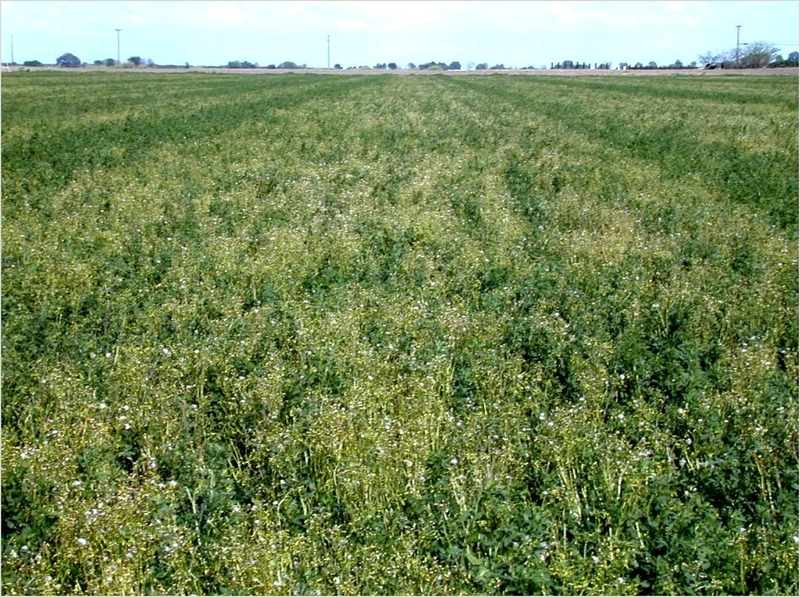 When applications of Sharpen, Shark and Gramoxone are made to non-dormant alfalfa, crop injury can occur. Particularly Sharpen, which will burn any aboveground growth of alfalfa back to the ground. In the Central Valley, Sharpen must be applied 75 days before first cutting otherwise yield reductions may occur. Combining pre- and post-emergent herbicides is important for controlling flushes of weed germination throughout the winter and spring. Incorporation of pre-emergent soil residual products by moisture is often needed to ensure effectiveness. Velpar (hexazinone), which also has post-emergence activity on small weeds, really shines as a pre-emergence product controlling all four Asteraceae species. However, research has shown groundsel control, in particular, can be reduced if foggy, low light conditions persist after application. Chateau (flumioxazin) applied to a dormant crop will give partial control of annual sowthistle, and effective control of the other three species. Various other herbicides with pre-emergent activity are labeled for use in alfalfa, but are not typically used to target common groundsel. The UC Davis Diagnostic Lab each year reports cases of horse or cattle poisoning originating from hay containing high amounts of common groundsel or other poisonous weeds. Lawsuits are not uncommon. Keeping hay contaminated with groundsel out of the mouths of livestock is crucial to avoiding potential problems. This starts with identifying weeds and controlling groundsel at the seedling stage before it can contaminate the hay produced. Before cutting and baling your hay, inspect the field to identify any potential toxic plants, particularly along field borders where they often occur, and make sure to separate out any bales that are contaminated. 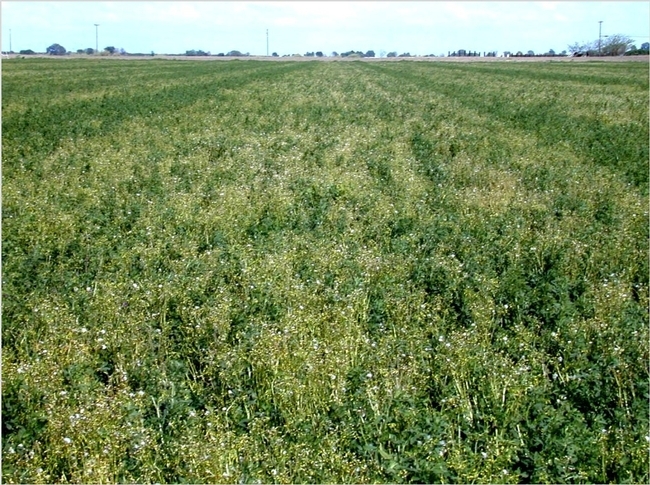 More detailed information about weed control and pest management in alfalfa can be found on the UC IPM website. Any mention of pesticides is not a recommendation or endorsement for use by the University of California. Trade names of pesticides are used throughout this blog for informational purposes only, and are not an endorsement of chemicals not mentioned. Always read the entire label and follow any restrictions. + Restricted material in the state of California. Permit and licensing required to purchase and apply this product. *There are confirmed populations of hairy fleabane which are resistant to either glyphosate, paraquat or both. Rotating and combining different modes of action is advised to prevent and delay herbicide resistance from developing.